Yesterday was Shrove Tuesday, when families all over the world gathered together in their kitchens, cracking eggs, stirring batter and making pancakes that they tossed in the air amidst howls of laughter and ate together around the table with all sorts of sweet things like sugar and lemon, maple syrup and blueberries, or strawberries and cream. This idyllic scene is how I love to remember this special time of year. As a mum of four I always looked forward to Pancake Day and tried to recreate this perfect picture every year in our home, but it didn’t always work out quite as I had planned. It would often begin well but there were soon arguments as the children took it in turns to make their own pancake and try and toss it, and inevitably drop it, or it stuck to the pan, and then their would be tears, and cries of, ‘It’s not fair, I can’t do it, or he’s taking too long, its my turn”. Traditionally, the reason we celebrate Shrove Tuesday and make pancakes is to use up all the rich foods like eggs, milk and sugar before the season of fasting begins the following day on Ash Wednesday for the 40 days of Lent. The word ‘shrove’ comes from the English word ‘shrive’ which means to obtain absolution for your sins through confession and penance. Therefore it is the party before the more serious task of living more simply, of reflecting on our excesses our vulnerability and repenting of our greed, selfishness and need to be in control. Today, Ash Wednesday marks the start of Lent when for the past few years we have launched a PassionArt Trail across our city of Manchester, using art works and spiritual reflections to explore themes from the Lent and Easter narrative. This year however is different. I was diagnosed with ovarian cancer in September and so this Lent, instead of curating exhibitions and live events my life is much more restricted and slower; after a successful operation in October my weeks are currently filled with chemotherapy sessions, sickness and learning to walk a journey of paradox; of uncertainty and vulnerability accompanied by hope and faith. 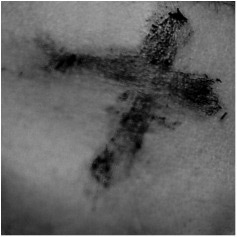 Today, on Ash Wednesday, I am reminded that I am a tiny part of a global and historic Church where at services all across the world Christians are marked with the symbol of the cross of Christ on our foreheads with ashes, with scripture spoken over us reminding us of our own mortality and the greatness of God our Heavenly Father, “Memento, homo, quia pulvis es, et in pulverem reverteris.” (“Remember, man, that thou art dust, and to dust thou shalt return.” Genesis 3:19). This ritual and the scripture spoken is ever more poignant for me and my family at this time as we slowly come to terms with the idea that we are not ultimately in control of our lives as we often like to think. But our lives and time are in Gods hands. He alone knows the plans he has for us, plans for good and not for evil. He alone knows how many days were allotted to our time here on earth when He knit us together in our mother’s womb, and He alone can bring healing and restoration to our bodies either through medical intervention or through miraculous healing. This season of Lent for me is about embracing vulnerability and deepening my understanding of faith, hope, love and trust in my God who has always been faithful to me and promises to continue be faithful whatever the next few years bring. The Bible does not run away from the notion of our own mortality. The Psalms are full of verses crying out to God to save us when life is dangerous and the road ahead is uncertain and full of trials and fears. This too is what the season of Lent teaches us, that beauty arises from the ashes, that the Hebrew nation spent 40 years wandering the wilderness before God brought them to the promised land. That Moses fasted for 40 days before receiving the word of God on Mount Sinai, and that Jesus spent 40 days alone and fasting in the wilderness, where he was tempted in the same ways we are, before he was able to begin his ministry of healing and salvation, and that the road to Jerusalem led to the cross before resurrection. The ashes and the wilderness is not a part of life we can escape. It is a part of the human condition. Celebrating the season of Lent each year helps us to put our lives in perspective, to not get too haughty or proud, to put aside things that have begun to become too important to us, to let go of our riches, our excesses, our egos and instead to consider our weakness and vulnerability, not just within ourselves but in those around us, and to share what we have, to give away what we realise we don’t need, to comfort those who are suffering and to attempt to live more simply, more reflective, more prayerful lives as we prepare ourselves for the unfolding story of Passion Week. Julian Stair’s iconic sculptures were a part of Be Still in 2016, housed within Manchester Cathedrals medieval sacred spaces. He crafts ceramic vessels that reference the containment of ashes after death. Funerary jars that remind us that we are made from the dust of the earth and to the earth we will return. They help us to gain a perspective on our lives when we get too proud, and they are a comfort for those who are grieving because they acknowledge and make material the reality and pain of their loss. The clay that forms them comes from the earth, then carefully crafted by the potters hand they take their unique form before taking their place in the burning furnace that will refine them into their final state of beauty. I see so many links to our lives in this process and this work. Formed by the heavenly potters loving hands, I am uniquely made and shaped through the continual turning of the wheel of my earthly life. If I desire eternal life, then like the pot, I need to experience the heat of the fire that will transform me from a soft clay jar into a permanent vessel. I cannot avoid this process, it is the only way. Lent is a time when I am invited to remember this, to slow down and reflect on the lessons I am learning on the constantly spinning wheel that is my life, and to learn to embrace the heat of hard times when it touches my life knowing that it is a part of the process of eternal life. BE STILL – Quietus Revisited: The vessel, death and the human body. The historic and beautiful religious setting of Manchester Cathedral acts as a fitting space for Julian Stair’s exhibition Quietus Revisited: The vessel, death and the human body, addressing the containment of the human body in death and reminding us of our own inevitable mortality. Life-sized artist made funerary jars and sarcophagi explore the symbolic language of ceramic vessels and the role they have played in rituals surrounding death and bereavement. These tactile, monumental works also act as metaphor for the body as container of the human spirit; Adams first form being created from the clay of the earth and animated by the breath and life of his creator. 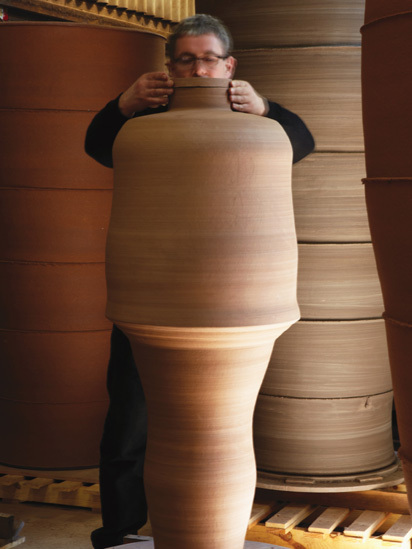 Julian Stair is one of the UK’s leading potters and writers on ceramics. Born in Bristol in 1955 he took up pottery at 16 and went on to study at Camberwell School of Art and the Royal College of Art. He has exhibited internationally over the last 30 years and has work in numerous public collections including the Victoria & Albert Museum and the British Museum. He works from his studio in East Dulwich London.